For someone who has never ventured out of Europe, travelling to Nepal for a cross-cultural placement was both exciting and filled with trepidation. 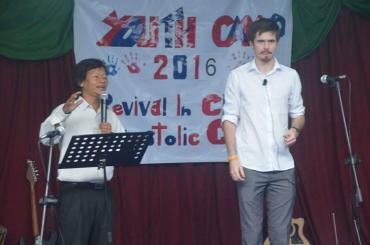 I am from Pillar Christian Church in Portadown and I spent nine intensive days preaching and serving, with my pastor, at two conferences, a kids’ club and a Saturday morning service (Sunday is the first day of the working week) in Apostolic Church, Kathmandu. Pillar supports the ministry and orphanage of Pastor Reuben Rai and his small network of churches. It was particularly poignant that we should go to serve on 31st May, a year and a month after the earthquakes that tore lives apart in Nepal. Kathmandu is still showing the scars of the tragedy, with heaps of rubble lying at the side of almost every street, but the hardest scars to see were the human ones. Pastor Reuben’s orphanage was destroyed – he has since built a small extension onto the church building where approximately a dozen children were sleeping on two beds. Due to generous donations, we were able to leave money for three bunk beds. Another extension was built to house a lady who had lost her legs in the earthquake, and her small son who lost part of his foot; I had to rely on grace to know how to react to such tragedy. Adapting to the culture was difficult - the Nepali people were very quiet and reserved toward us. However, after battling through a bout of sickness to give a children’s talk, I think, I earned their respect and confidence. I later discovered that the people are used to empty promises from Westerners, which may have caused distrust. Through this experience I learnt two things – how to persevere through adversity for the sake of the gospel and how God works all things for the good of those who love him.